Display 3 1/2-digit LCD; 4000 count; backlight-illuminated; logarithmic bar graph; extension bar graph-no fluctuations, as the display shows the digits of a reading in the order in which each digit settles. Comparator Function The MY40 alerts you by turning on the LOW symbol and sounding the buzzer if the measured value is smaller than the reference value. You can allocate as many as three user-defined reference values to each rating. The factory-set defaults are 0.1 M Ohms, 0.2 M Ohms and 0.4 M Ohms. Memory Function For each rating, you can save as many as 20 measurements at desired memory address numbers. Automatic Discharge Function The MY40 automatically begins discharge when you turn off the MEAS switch. You can monitor the state of discharge by checking the bar graph and make sure discharge is complete by checking that the segment bar disappear. 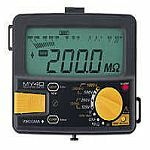 High-Voltage Indicators The high-voltage symbol and LED lamp come on to alert you when the MY40 is in insulation testing mode or if any voltage remains to be discharged. Live-Line Alarm If you apply an AC voltage of approximately 40 V or higher across the input terminals, the MY40 alerts you by blinking the LED lamp and sounding the buzzer. Overrange Input Alarm If the voltage being measured exceeds 600 V during AC voltage measurement, the MY40 alerts you by flashing the Maximum Value indicator and sounding the buzzer. Auto-Hold Function The tester retains the measured resistance for approximately 5 seconds after the MEAS switch is turned off.